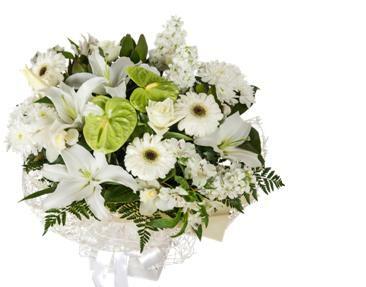 Funeral Flowers Auckland, New Zealand- Sympathy Flowers, wreaths, casket sprays Auckland. Thanks so much for the photos, the flowers are beautiful and Mandy loved them. Thanks again. Sending flowers for a funeral is a heartfelt gift to show the family you care. As professional florists we work closely with families making funeral arrangements, friends and associates sending bereavement flowers and sympathy bouquets, and funeral homes holding services. Flowers are an integral part of the funeral process. In fact, sympathy flowers have been part of funeral and memorial traditions in nearly every culture throughout history. What are the right type of flowers to send to a Funeral? If you are sending condolence flowers to the home, then we highly recommend sending a vox bouquet. Your flowers will be delivered in water, with flower food and this makes it extremely easy for the bereaved family to look after in this busy and stressful time. They will also run out of vases very quickly so this is the perfect answer. The other choice our florists would recommend is a floral arrangement, to look after an arrangement of sympathy flowers they only need to add a little bit of water each day. Whether you choose soft and subtle shades, or bright and cheery flowers to celebrate the life of the deceased, there is no right or wrong approach, the choice is up to you. The best advice is to select a sympathy gift you think the family will appreciate. To send flowers to the funeral, the most popular choice would be to send a vox bouquet or sheaf of flowers. In New Zealand wreaths of flowers are traditionally sent to the funeral itself and not to the home. A funeral wreath is usually sent by absent family members, or groups, organisations and workplaces as a more formal gesture of remembrance. We can also make floral wreaths for ANZAC Day. If you are looking for Casket Sprays for the top of the coffin, we would be honoured to help you choose something special for your loved one. To enable us to get your delivery made to the funeral on time - we need the name of the deceased, the funeral directors, the place and time of the funeral service. You can order your funeral flowers securely online or if you prefer to call us direct on 09 838 9058 to speak with our team of florists to make your arrangements. We look forward to being of service to you.